A reduced-gravity aircraft is a type of fixed-wing aircraft that provides brief near-weightless environments for training astronauts, conducting research and making gravity-free movie shots. Versions of such airplanes were operated by the NASA Reduced Gravity Research Program. The unofficial nickname "vomit comet" became popular among those who experienced their operation. Parabolic flight as a way of simulating weightlessness was first proposed by the German aerospace engineer Fritz Haber and the German physicist Heinz Haber in 1950. Both had been brought to the US after World War II as part of Operation Paperclip. Parabolic flights are also used to examine the effects of weightlessness on a living organism. While humans are by far the most common passengers, non-human animals have occasionally been involved in experiments, including a notable experiment on how weightlessness affected a domestic cat's righting reflex and a pigeon's attempts to navigate in a weightless state. The aircraft gives its occupants the sensation of weightlessness by following a parabolic flight path relative to the center of the Earth. While following this path, the aircraft and its payload are in free fall at certain points of its flight path. The aircraft is used in this way to demonstrate to astronauts what it is like to orbit the Earth. During this time the aircraft does not exert any ground reaction force on its contents, causing the sensation of weightlessness. Initially, the aircraft climbs with a pitch angle of 45 degrees using engine thrust and elevator controls. 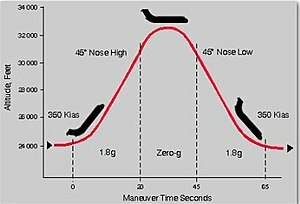 The sensation of weightlessness is achieved by reducing thrust and lowering the nose to maintain a neutral, or "zero lift", configuration such that the aircraft follows a ballistic trajectory, with engine thrust exactly compensating for drag. Weightlessness begins while ascending and lasts all the way "up-and-over the hump", until the craft reaches a downward pitch angle of around 30 degrees. At this point, the craft is pointing downward at high speed and must begin to pull back into the nose-up attitude to repeat the maneuver. The forces are then roughly twice that of gravity on the way down, at the bottom, and up again. This lasts all the way until the aircraft is again halfway up its upward trajectory, and the pilot again reduces the thrust and lowers the nose. This aircraft is used to train astronauts in zero-g maneuvers, giving them about 25 seconds of weightlessness out of 65 seconds of flight in each parabola. During such training, the airplane typically flies about 40–60 parabolic maneuvers. In about two thirds of the passengers, these flights produce nausea due to airsickness, giving the plane its nickname "vomit comet". The Canadian Space Agency and the National Research Council have a Falcon 20 used for microgravity research. The small plane is normally not used for people to float freely and experience weightlessness; however, comedian Rick Mercer did so for a segment of his show. The first zero G plane to enter service in Latin America is a T-39 Sabreliner nicknamed CONDOR, operated for the Ecuadorian Civilian Space Agency and the Ecuadorian Air Force since May 2008. On June 19, 2008, this plane carried a seven-year-old boy, setting the Guinness world record for the youngest person to fly in microgravity. Since 1984, ESA and the CNES have flown reduced-gravity missions in a variety of aircraft, including NASA's KC-135, a Caravelle, an Ilyushin IL-76 MDK and an Airbus A300 known as the Zero-G. In 2014 the A300 was phased out in favor of a more modern Airbus A310, also named Zero-G. It is based at Bordeaux-Mérignac airport in France, operated by Novespace, and has also been flown from Paris Le Bourget airport and Dübendorf Air Base in Switzerland. Since 1997 CNES subsidiary Novespace has handled the management of these flights. This A310 Zero-G aircraft is used also to realize commercial flights for public passengers in partnership between operator Novespace and the Avico company, under Air Zero G brand. The aircraft has also been used for cinema purposes, with Tom Cruise and Annabelle Wallis filming for The Mummy in 2017. In Russia, commercial flights are offered on the Ilyushin Il-76 jet; several U.S. companies book flights on these jets. OK Go, an American alternative rock band, made a music video for their song "Upside Down & Inside Out" while moving about in microgravity. The music video was shot on an Il-76 MDK jet as part of an advertising campaign for Russian S7 Airlines. NASA flew zero gravity flights on various aircraft for many years. In 1959 Project Mercury astronauts trained in a C-131 Samaritan aircraft dubbed the "vomit comet". Twin KC-135 Stratotankers were used until December 2004, but later retired. One, a KC-135A registered N930NA (also known as NASA 930, formerly USAF serial no. 59-1481), flew more than 58,000 parabolas after NASA acquired it in 1973, before being retired in 1995. It is now on display at Ellington Field, near the Johnson Space Center. The other (N931NA or NASA 931, formerly AF serial no. 63-7998) was also used by Universal Pictures and Imagine Entertainment for filming scenes involving weightlessness in the movie Apollo 13; it made its final flight on October 29, 2004, and is permanently stored in the Pima Air & Space Museum in Tucson, Arizona. In 2005 NASA replaced the aircraft with a McDonnell Douglas C-9B Skytrain II (N932NA) formerly owned by KLM Royal Dutch Airlines and the United States Navy. NASA canceled the Reduced Gravity Research Program and ceased operations in July 2014. As of 2015[update] NASA had a microgravity services contract with Zero Gravity Corporation (ZERO-G) and used its aircraft, G-FORCE ONE, a modified Boeing 727-200. In late 2004, the Zero Gravity Corporation became the first company in the United States to offer zero-g flights to the general public, using Boeing 727 jets. Each flight consists of around 15 parabolas, including simulations of the gravity levels of the Moon and Mars, as well as complete weightlessness. This profile allows ZERO-G's clients to enjoy weightlessness with minimal motion discomfort. In 2014, Integrated Spaceflight Services, the research and education partner of Swiss Space Systems (S3) in America, began offering comprehensive reduced-gravity services on S3's Airbus A340 aircraft, as well as FAA certification of science and engineering payloads. This project has been unsuccessful and Swiss Space Systems has bankrupted and ceased all operations. Aurora Aerospace in Oldsmar, Florida offers zero-g flights using a Fuji/Rockwell Commander 700. It is also used to simulate the gravity of the Moon and Mars. According to former Reduced Gravity Research Program director John Yaniec, anxiety contributes most to passengers' airsickness. The stress on their bodies creates a sense of panic and therefore causes the passenger to vomit. Yaniec gives a rough estimate of passengers, that "one third [become] violently ill, the next third moderately ill, and the final third not at all." Vomiting is referred to as "ill". Scopolamine is often used as an antiemetic during reduced-gravity-aircraft training. ^ "NASA Reduced Gravity Research Program". Jsc-aircraft-ops.jsc.nasa.gov. 2009-03-17. Archived from the original on 2009-08-25. Retrieved 2009-09-14. ^ "NASA - What's the Vomit Comet?". Archived from the original on May 5, 2012. Retrieved May 15, 2012. ^ Haber, Fritz; Haber, Heinz (1950). "Possible methods of producing the gravity-free state for medical research". Journal of Aviation Medicine. 21 (5): 395–400. PMID 14778792. Summary of the article: Campbell, Mark R. (2009). "Classics in space medicine. Possible methods of producing the gravity-free state for medical research". Aviation, Space, and Environmental Medicine. 80 (12): 1077. doi:10.3357/ASEM.26010.2009. PMID 20027862. ^ Burkhard, Ford (1998-08-28). 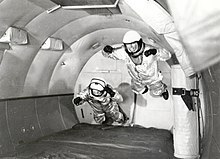 "Fritz Haber, 86, Dies; Simulated Weightlessness of Space". New York Times. ^ William Tyrrell Thomson, Introduction to Space Dynamics, Dover 1986. p. 91. ^ "C-9B Flight Trajectory". Jsc-aircraft-ops.jsc.nasa.gov. 2009-03-17. Archived from the original on 2009-12-13. Retrieved 2009-09-14. ^ a b Golightly, Glen (October 20, 1999). "Flying The Vomit Comet Has Its Ups And Downs". space.com. Archived from the original on 2006-03-10. ^ "Reduced Gravity: Vomit Comet Blog". PhysicsCentral. May 10, 2005. Retrieved 2007-11-07. ^ "Falcon 20 - Facilities - NRC-CNRC". Archived from the original on June 11, 2011. Retrieved June 26, 2009. ^ "RMR: Rick and Zero Gravity". YouTube. 2011-06-16. Retrieved 2016-02-24. ^ "Exa And Fae Develops First Zero-G Plane In Latin America". Exa.ec. 2008-04-10. Retrieved 2009-09-14. ^ "Youngest person to experience microgravity". Guinnessworldrecords.com. Retrieved 2009-09-14. ^ "Air Zero-G About Us". airzerog.com. Retrieved 2014-03-11. ^ "ESA's A300 Zero-G Program" (in Dutch). Spaceflight.esa.int. Archived from the original on 2009-08-28. Retrieved 2009-09-14. ^ "Own vomit comet: Swiss make first zero-G flight — RT News". Rt.com. 2015-09-23. Retrieved 2016-02-24. ^ "CNES : PR56-2004 - New parabolic flight campaign". Archived from the original on June 27, 2009. Retrieved October 4, 2008. ^ "French astronaut performs "Moonwalk" on parabolic flight - Air & Cosmos - International". Air & Cosmos - International. Retrieved 2017-08-29. ^ "'The Mummy': Behind the Scenes of That Zero-G Stunt (Exclusive)". The Hollywood Reporter. Retrieved 2017-08-29. ^ "Zero-gravity flights go mainstream - Technology & science - Space | NBC News". Msnbc.msn.com. 2004-09-16. Retrieved 2016-02-24. ^ Sage, Alyssa (2016-02-11). "Watch: OK Go Filmed a Music Video Entirely in Zero Gravity". Variety. Retrieved 2016-02-12. ^ "Upside Down & Inside Out Faq & Credits |". Okgo.net. 2016-02-11. Retrieved 2016-02-24. ^ "TUTKOVBUDKOV is the agency behind the unique video". Archived from the original on 24 February 2016. Retrieved 23 February 2016. ^ "Mercury Astronauts in Weightless Flight on C-131 Aircraft". 2006-08-02. Retrieved 2013-05-14. . Page hosts a NASA photograph dated 01/01/1959. ^ "C-9B History". NASA. Archived from the original on 2009-12-15. Retrieved 2009-09-14. ^ "Flight Opportunities program". NASA. Retrieved 2013-04-22. ^ Boyle, Alan (2004-09-16). "Zero-gravity flights go mainstream". NBC News. Retrieved 2009-09-14. ^ "Integrated Spaceflight Services". Integratedspaceflight.com. Retrieved 2015-04-06. ^ "Swiss space firm declared bankrupt". 2016-12-16. Retrieved 2017-08-29. ^ "Our Training Programs". Aurora Aerospace. Archived from the original on 2009-01-30. Haber, Fritz and Haber, Heinz: "Possible Methods of Producing the Gravity-Free State for Medical Research", Journal of Aviation Medicine XXI (1950). Karmali, Faisal and Shelhamer, Mark. "The dynamics of parabolic flight: flight characteristics and passenger percepts". Acta Astronautica (2008). Easton, Pam (October 30, 2004). NASA's weightless aircraft is retired. Associated Press. Golightly, Glen (May 15, 2000). Vomit Comet finds a home. Space.com Houston Bureau. Overbye, Dennis (March 1, 2007), "Stephen Hawking plans prelude to the ride of his life", New York Times. Wikimedia Commons has media related to Reduced gravity aircraft. Virtual tour of the Airbus A-300 Zero-G. This page was last edited on 17 February 2019, at 02:27 (UTC).